"Can an officer have a loyalty to anything greater than his country?" A24 has unveiled a trailer for a WWII romantic thriller titled The Exception, based on a novel by Alan Judd titled "The Kaiser's Last Kiss". The film stars Jai Courtney as a German soldier investigating the Dutch resistance in Holland, looking for a spy in the home of Kaiser Wilhelm. He meets a young Jewish Dutch woman played by Lily James and falls in love with her, hence the title (she's "the exception"). The full cast includes Christopher Plummer, Ben Daniels, Janet McTeer, Eddie Marsan, Mark Dexter, and Martin Swabey. This honestly doesn't look half bad, but I'm not sure it seems that good either. Lily James is great, but Jai Courtney not so much. A German soldier (Jai Courtney) tries to determine if the Dutch resistance has planted a spy to infiltrate the home of Kaiser Wilhelm in Holland during the onset of World War II, but falls for a young Jewish Dutch woman (Lily James) during his investigation. 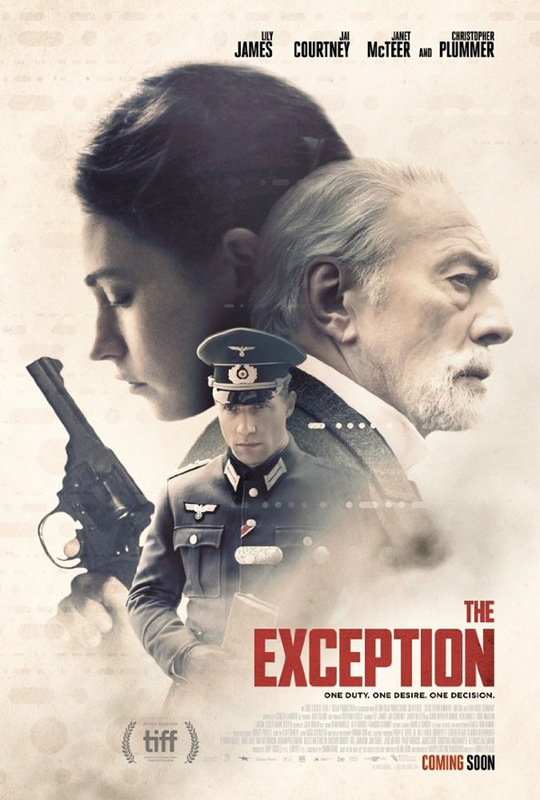 The Exception is directed by English filmmaker David Leveaux, a veteran stage director making his feature film debut with this. Leveaux has been nominated for Broadway's Tony Award five times. The screenplay is written by Simon Burke; based on the novel "The Kaiser's Last Kiss" by Alan Judd. This premiered at the Toronto Film Festival last year, and is also playing at Tribeca this year. A24 will release The Exception in theaters starting on June 2nd this summer. Thoughts?